Emily Blunt looks beautiful in Anna Hu earrings at Cannes 2015. Photo by Gisela Schober. Another of my favorite looks coming out of Cannes this year is the glorious ensemble on Emily Blunt, which she wore to the premiere of Sicario. In addition to a glittering Stella McCartney column gown with an open back, she had on four pieces of stunning jewelry by Anna Hu Haute Joaillerie. I have been looking for more Anna Hu jewelry on the red carpet since her work caught my eye at the Oscars this year, with amazing earrings worn by both Naomi Watts and Gwynneth Paltrow, so I was happy to see her designs being worn in Cannes! I know the photos are huge but I wanted to them to be big so you could really get a close look at the amazing detail of these pieces. The earrings Emily wore are called the Modern Art Deco Earrings in Emerald II and feature two pear-shaped emeralds weighing 31.56 carats, with two step-cut emeralds weighing 7.8 carats, and emeralds and brilliant-cut white diamonds, all set in 18K white gold. Naomi Watts wore a pair of Anna Hu’s Modern Art Deco earrings to the Oscars, though that pair featured purple-toned sapphires. Emily looks perfect in these magnificent emeralds! I love this full shot of the dress and jewelry. Perfection! Photo by David Fisher. 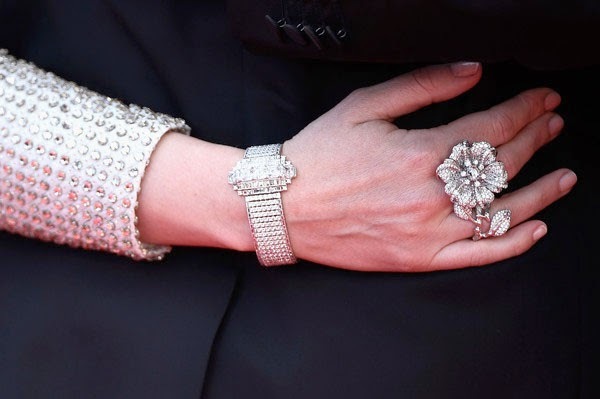 One of the bracelets Emily wore is also one Naomi Watts wore to the Oscars, called the Wallis Simpson Bracelet, named in honor of the Duchess of Windsor. It features D-color emerald-cut white diamonds and round brilliant-cut white diamonds, a total of 35 carats in all, set in white gold. Love love love. Emily and a trio of handsome gents at Cannes 2015. Photo by Tristan Fewings. In the picture above, Emily is with her co-stars of Sicario, Benicio del Toro and Josh Brolin, and the film’s director, Denis Villenueve. I think they make quite an attractive quartet, don’t you? Emily’s dress and jewelry look great next to the gents in their suits and tuxes against the red carpet. Well done, people! The back of the gown. Wow. And look at the height of those heels! Photo by Pascal Le Segretain. Gorgeous detail shot of the Wallis Simpson Bracelet and Duchess Hibiscus Ring. Photo by Ian Gavan. I love the wonderful detail shots photographer Ian Gavan got of the jewelry, especially the Duchess Hibiscus Ring. It is from one of Anna’s earliest collections and features a total of 9.12 carats’ worth of diamonds and two shanks, allowing it to be worn stacked on one finger or opened across two fingers, as Emily has worn it here. Her neutral manicure allows the bracelets, Duchess Hibiscus ring, as well as her own diamond engagement and wedding band to take center stage, as they should! Another amazing shot showing the emerald and diamond bracelet by Anna Hu. Photo by Ian Gavan. The other bracelet Emily wore was the Ellington Bangle in Emerald. It features 10 emeralds weighing 15.80 carats, surrounded by diamonds cut in an assortment of ways. Oh, you know I weep just looking at that bracelet. Superb! Let me know what you think of Emily’s Stella McCartney dress and Anna Hu jewels! Wow, her dress and jewels are stunning. The dress fits her perfectly and the color and details really make Emily shine. The emeralds are really beautiful. I love the images you posted, Jill! I have a big crush on EB and must see more of her movies.